One of our tours enjoy the site (and the sunshine). The next generation of archaeologists at the Excavation Club. 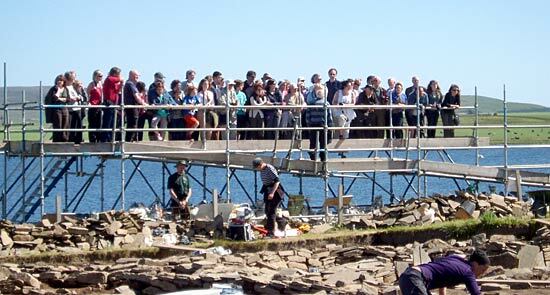 Welcome, once more, to everyone out there in the archaeosphere from a very sunny and hot Ness of Brodgar. There were some groans of anticipation early in the morning when the hot sun and calm conditions brought swarms of midges from the loch but, and it’s a big “but”, these are midges of the non-biting persuasion. Certainly, it is irritating when they land in your tea, or even you eyes and nose, but a quick snort and splutter gets rid of them quickly. We make no apologies for starting the daily diary yet again with the weather. It is very important for diggers who spend all day out in the elements and each morning sky is scanned anxiously for signs of what the day will bring. There is no happy medium in Orkney, however. You are either roasted and dehydrated, soaked and frozen, or just plain enveloped in mist. A hive of activity in Structure One. But back to the archaeology . . .
Unsurprisingly, we have had yet another busy day, with many scores of visitors on the tours (11am,1pm and 3pm weekdays), many of whom seemed genuinely amazed as the site unfolded before them. 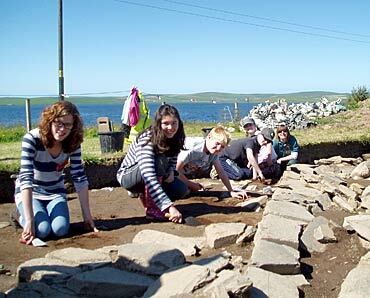 Special guests were the youngsters of the Excavation Club, who had some digging practice with Historic Scotland’s rangers Sandra, Elaine and Keith, with help from Helen. There are strong rumours that site director Nick Card’s two young daughters will be joining the regular Excavation Club very soon, thus ending Nick’s annual escape from an all-female household. In fact Beth, his younger daughter, formed part of team today and was thrilled to find some bone and flint. In Structure One, the team have been looking at the side recesses and removing the last vestiges of the dumps of material that obscure the later phase floor deposits. Adam uncovered, amongst a host of finds, a high quality plano-convex fint knife which may well qualify as find-of-the-day. Jo proudly displays her decorated pot discovery. In the central midden area, the Willamettes have continued to work away and have been rewarded with several spreads of pottery. Two stood out; the first is a half circle of conjoined pot, probably from half-way up the body of the vessel. Surprisingly, it appears to be firm and in quite good condition, unlike much of the low-fired pottery from the midden. The other is a large chunk of body sherd, which is decorated with converging applied cordons which have been slashed diagonally to imitate rope. Unfortunately, it is not in good condition and its excavation is a nerve-racking experience for Jo, who is in charge of its immediate future. In Structure Ten, Mike and his team have been puzzling over a number of small, shallow depressions ranged around the hearth. Although they do not, at the moment, appear to constitute a coherent arrangement, they appear to be either vestigial post holes, perhaps for some sort of suspension of material over the hearth, or perhaps shallow sockets fro placing small dished or flat-bottomed pots. Work has continued in Structure Twelve on the removal of more midden material. The robber trench that had removed much of its inner east wall is now fully defined and ready for planning, and then the removal of the baulks. 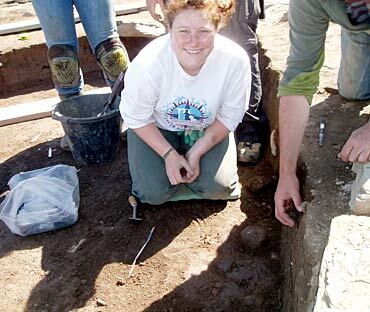 In Structure Eight, Dr Cathy Batt has continued the second series of samples for her archaeomagnetic dating programme. If we feel strong enough (and if we feel we can pretend sufficiently that we understand it) we will explain, at a later date, the rehydroxylation dating programme she is involved in. My name is Craig, and I am a joint geography-archaeology student at the University of Aberdeen. I have just completed second year – so that’s the easy part finished! 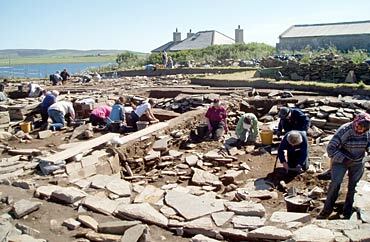 – and in preparation for my third year I am here at the Ness of Brodgar for the first two weeks of excavation. Aside from two days in Aberdeen, this is my first experience of an archaeological excavation, and it has been a brilliant experience. The learning curve has been steep, and I have learnt that even the seemingly simple task of using a trowel actually requires a certain amount of technique. I have been working alongside UHI students and other volunteers in the new trench next to Structure Fourteen, in which we hope to find another structure of similar design. At first it all went to plan, but then as more stones have appeared where they aren’t expected, the plot has thickened. As I am learning however, this is part of the nature of archaeology; you never quite know what you will uncover, and there are many red herrings along the way. For me, this puzzle actually makes excavation all the more exciting. Jim Rylat, who is supervising our area, is probably fed up of me asking him whether a find is pottery or stone. Red sandstone in particular has been tricky, as it looks just like pot to my eyes. Over the past week my recognition has improved though, and as Jim has explained, a lot of archaeological knowledge and skills can only be learnt through practice and learning from mistakes. I feel extremely lucky to be here at the Ness, and it is quite likely that I will never see a site like this again. Despite the inconsistent weather, everyone’s spirits have remained high and it is a wonderful feeling to be a part of this enthusiastic and slightly muddy bunch. 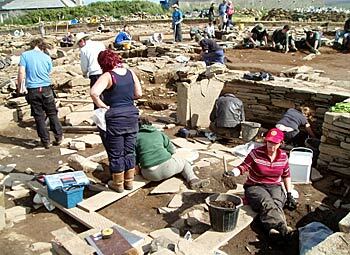 Everyone at the Ness is here because they have an interest in archaeology, and I think that with our diverse range of backgrounds and experience, we can all learn something from each other.